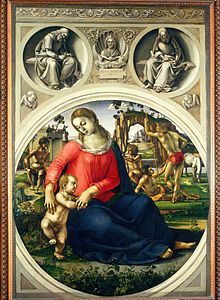 Signorelli Tondo, Medici Madonna, c. 1489-90. 1) Tentative title: “Making and Unmaking Jewish Identities: Primo Levi at the Jewish Museum of Rome”: This essay examines the 2013 exhibition, mounted at the Jewish Museum of Rome, of three portraits of Primo Levi by American artist Larry Rivers. 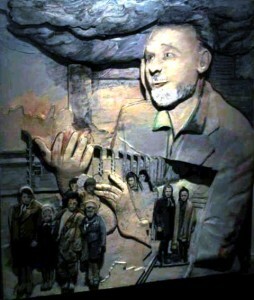 It tries to set the exhibition and portraits within a wide context that includes the painful events of 1982, including the Israeli invasion of Lebanon, Primo Levi’s criticisms of the invasion, the massacres at Sabra and Shatila, tensions between the Italian Left and the Jewish communities, and the attack on the synagogue that killed two year old Stefano Gay Tache. Under consideration at boundary 2. 2) Essay on Luca Signorelli and Queer Unhistoricism. This essay argues for the value of bringing the queer unhistoricism debates to Renaissance art. Like the Levi essay, it marks a difference in my own thinking. In the past, I have tended to be critical of the overly polemical tone of these debates, but, in these two essays, I suggest their value, given a not-so-subtle historicism that I believe currently underwrites LGBTQ Italian historiography. Under consideration. 3) Essay on Italian Jewish identity, co-written with Dr. Dan Clasby, Assistant Professor of History, Kings College. Under consideration at NeMLA. 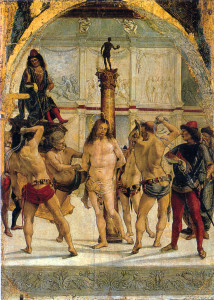 4) Essay on representations of the flagellation. This work is a continuation of work begun in Italian Masculinity as Queer Melodrama. 5) Book idea, a cultural history informed by the Queer Unhistoricism debates that takes as its object several gay artists working during the Italian fascist years, including Sandro Penna, Corrado Cagli, Guglielmo Janni, and Filippo de Pisis. This work builds on my Aesthetic Modernism and Masculinity.